Does high-res sound better than CD? 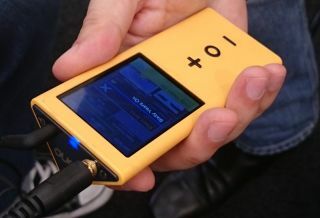 Pono execs reportedly aren't sure | What Hi-Fi? Neil Young's Pono Music service aims to bring high-res audio to the masses, but reports suggest while Young is convinced by high-res, some Pono staff aren't – and see it purely as a business and marketing decision. The PonoPlayer was on show at CES 2015, where Young also took the chance to reveal his plans for high-res audio in cars, but not everyone is convinced the high-resolution audio numbers add up - and it appears that includes people inside Pono. The NY Post reports a source at Pono who says people at the company "don't necessarily believe it" and the push for high-res audio is purely "a business decision". The quotes, credited to a source close to the situation, said: "It has been clear throughout that Neil Young himself is all about the hi-res. There’s no doubt in his mind that it sounds better." In fact, Young has said that "Pono is the same as the iPod but it sounds like God". Others at Pono apparently aren't convinced: "Their take is that the serious audiophile has convinced himself he has to have it. They’re saying, 'We don’t necessarily believe it, but nobody’s going to buy it if we don’t do it.'" Naturally, this isn't the best of news for Young and Pono, who are already facing a wider public - not to mention plenty of enthusiasts - who need convincing of the merits of better than CD-quality audio. You can read our thoughts on the matter in our 'High-res audio: the science behind the numbers' article. The Pono Music store for high-res downloads launched last week in the US, while the PonoPlayer sold out via Kickstarter and can now be pre-ordered for delivery in February. There was plenty of noise about high-res audio at CES, with Tidal telling What Hi-Fi? that it has plans for a high-res streaming service, and Bob Stuart, founder of Meridian Audio, and Craig Kallman, CEO Atlantic Records, talking to What Hi-Fi? about its plans for MQA and high-res audio. Sony also launched its new flagship high-res Walkman. Are you convinced by high-res audio and Neil Young's Pono project? Let us know in the comments below.